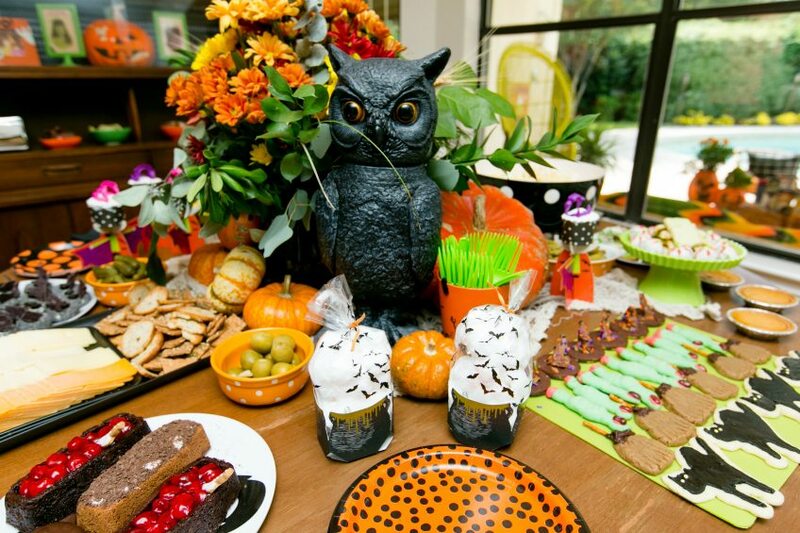 How do you decorate a creative Halloween themed vignette and food table for parties and photo shoots? You’re in luck, I happen to have a wee bit of experience in the matter. Ok a lot of experience. 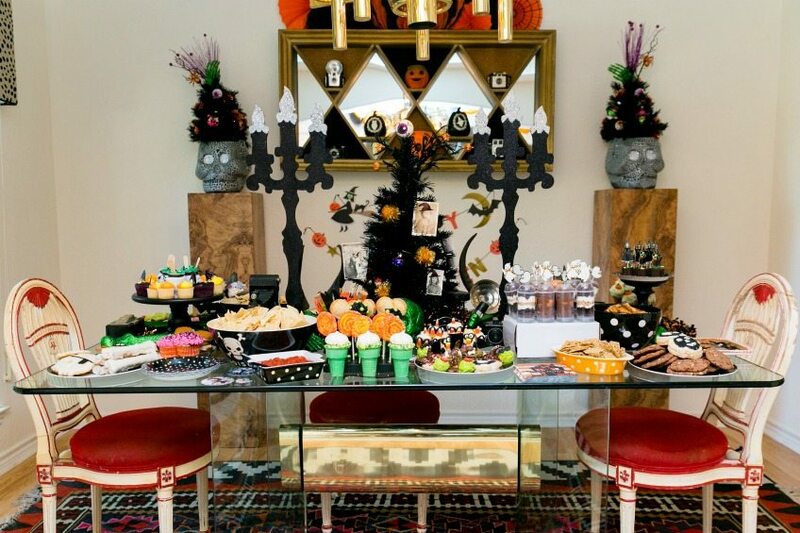 I love decorating for a Halloween Party and no two tables, shelves or vignettes are the same each year. I host an annual Halloween party where I begin baking 3 months in advance to make tables full of custom yummy (and spooky) Halloween treats. 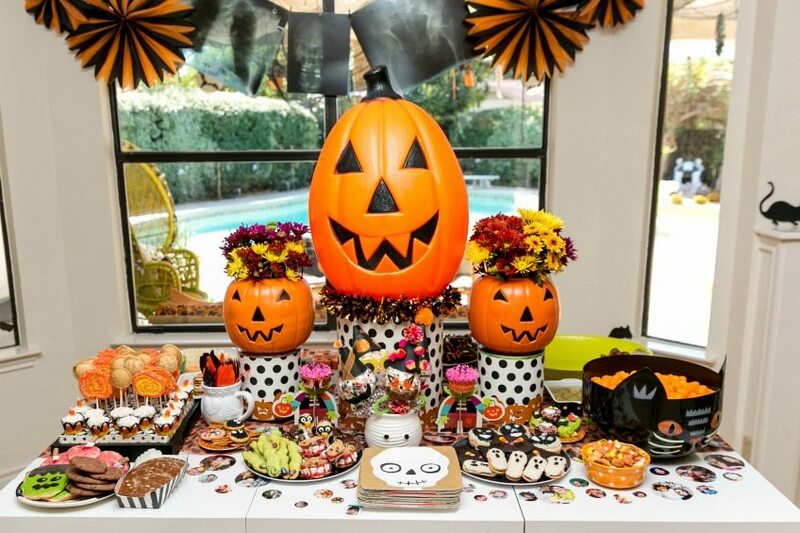 I want to share a few of my favorites I’ve decorated through the years as well as some hosting tips to hopefully inspire your Halloween in a fun and festive way. Zombies and gore are overrated. My kinda Halloween involves hot pink and glitter. 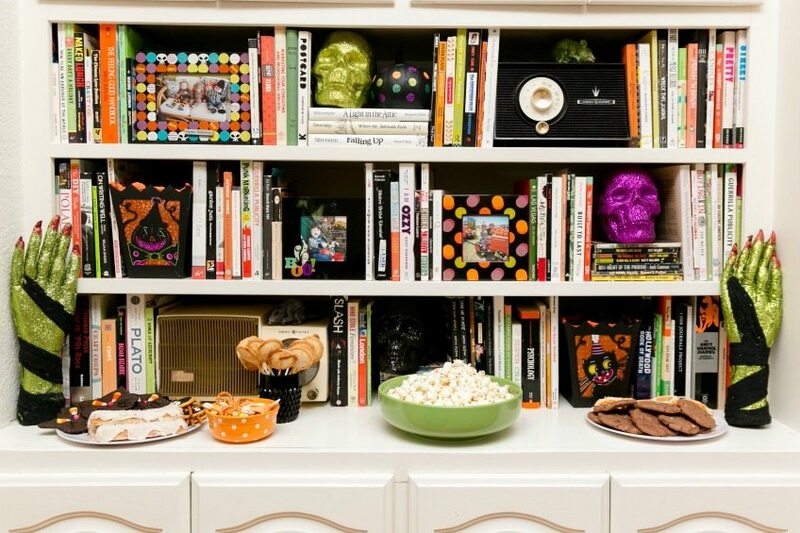 Comb the candy, cookie and treat aisles and get inspired by what you see. I saw these chocolate cups at Tuesday Morning without knowing what I was going to make until I got home. I filled the cups with brownies, sprinkled green candy rocks and candy bones on top. Finished everything off with some cupcake toppers of witches. Get more Halloween witch inspiration here. 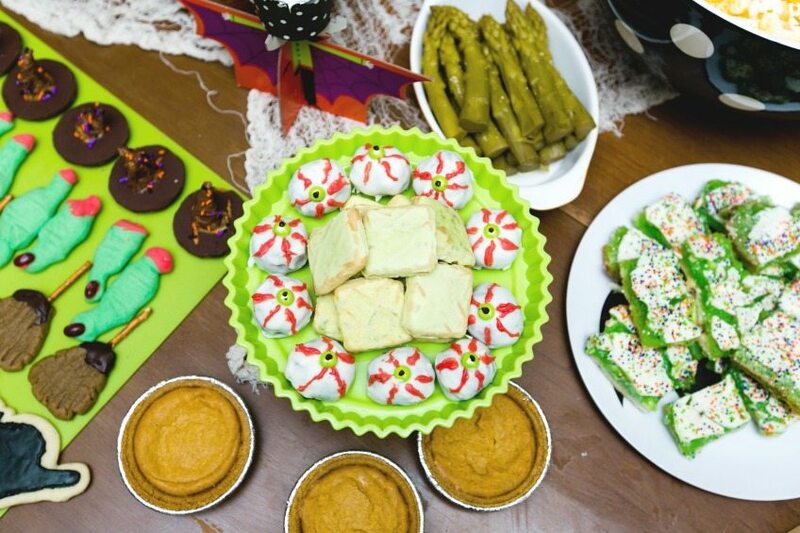 Add some color to your Halloween treat table by thinking beyond black. When done right hot pink fits right in to Halloween. Especially when it involves giving Frankenstein a bouffant hair-do. Want the DIY to make those teal pumpkins? Sure you do. The more anthropomorphic your food the better. In other words Ritz crackers with Sunbutter inside is tasty. Add eyeballs and pretzel legs and your spider sandwich is irresistible. If you can put eyeballs on it, do it. 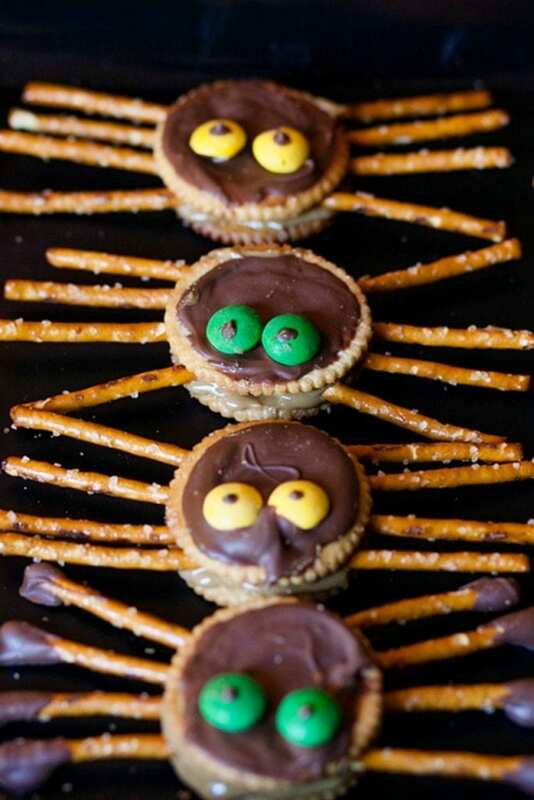 Check out more Halloween spider DIY ideas here. If you have 100 people coming to your party (my last had 120) you don’t need to make or buy 100 of everything. Make a dozen of this and two dozen of that. My motto is the more the merrier when it comes to Halloween baking variety. There may only be 12 Dracula’s Dentures cookie sandwiches and they are first come, first serve. Don’t forget to personalize your Halloween party with custom photo confetti. Remember that part about when you can make your food into an animal (bat, owl, spider, crow, snake). Same goes for body parts. 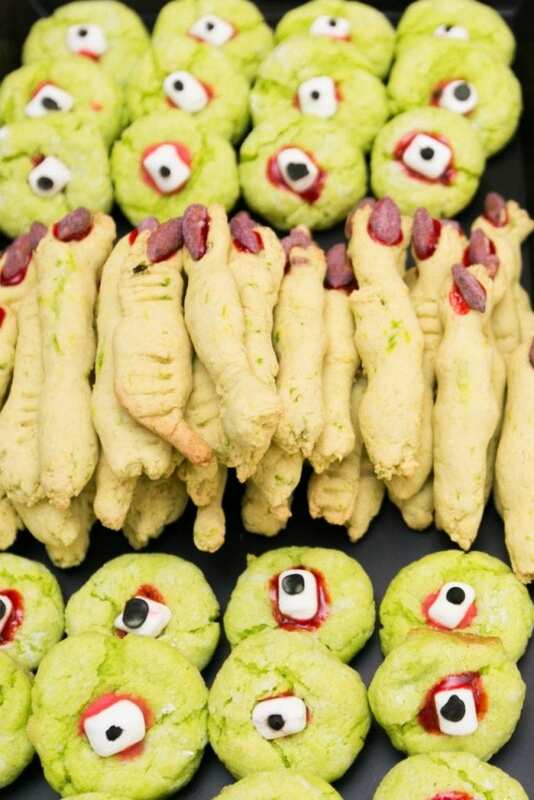 Kids will squirm and squeal delight with monster eyeballs (green cookies, red food gel and marshmallows). Adults love the taste of my almond shortbread which fingers. These would go perfect with my Halloween Eyeball Wreath on DIY Network. Spread the food around. Don’t create a bottle neck having all your food in one place. Try and have several focal point tables. 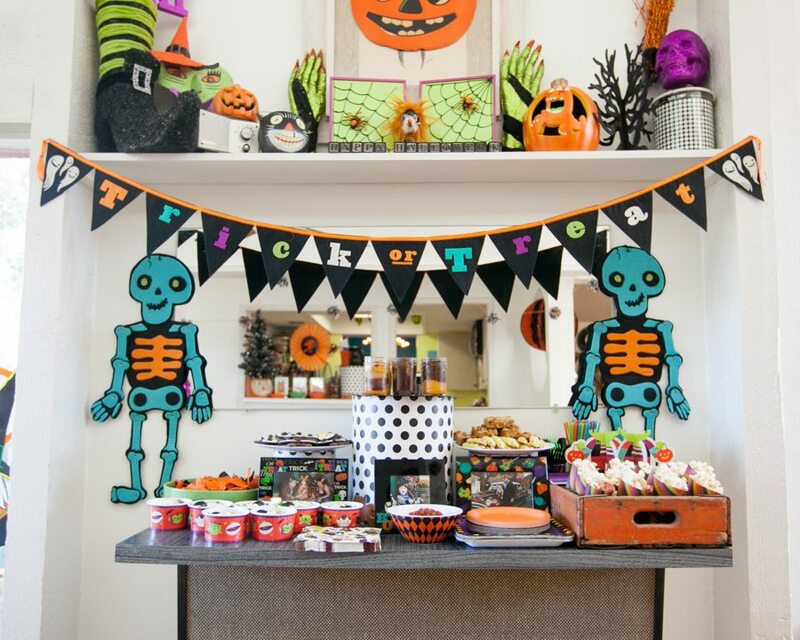 When you incorporate in decorations like these Halloween picture frames with the food it helps set the scene and fill the space leaving you more plates of food to put other places in the house. 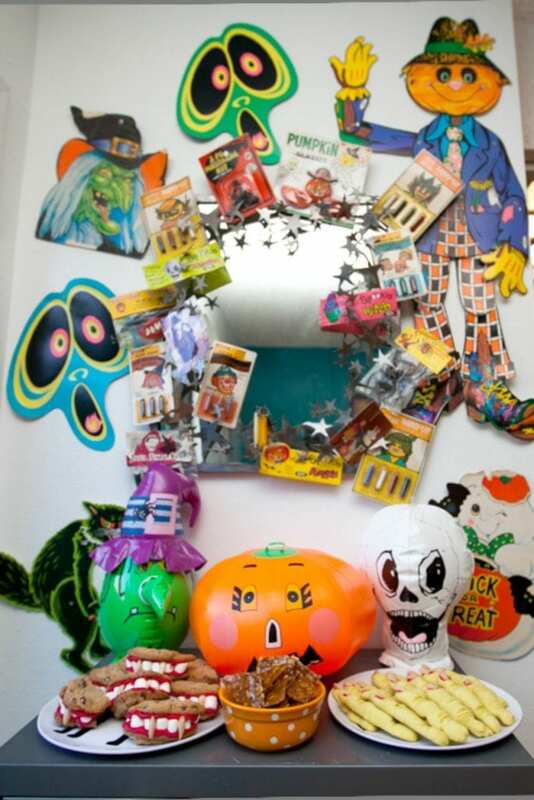 Want more ideas about using teal Halloween decorations? I don’t, but I should label what food is. I have a child with peanut allergy so I am very sensitive to that. 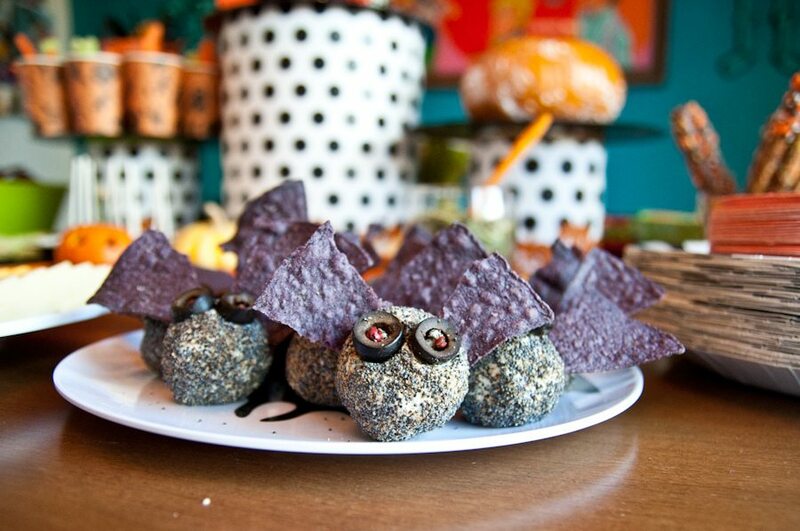 However, not everybody likes things like goat cheese and peppercorn bat shaped cheese balls. These take a lot of time and nothing is more irritating than seeing someone take one bite, spit it out and say: “yuck I hate goat cheese”. Give them a heads up with a sign and point them towards the queso bar. Here are a few more Halloween bat and Dracula themed projects. Not only should you not put all your food in the same place you should also spread the things you made out. 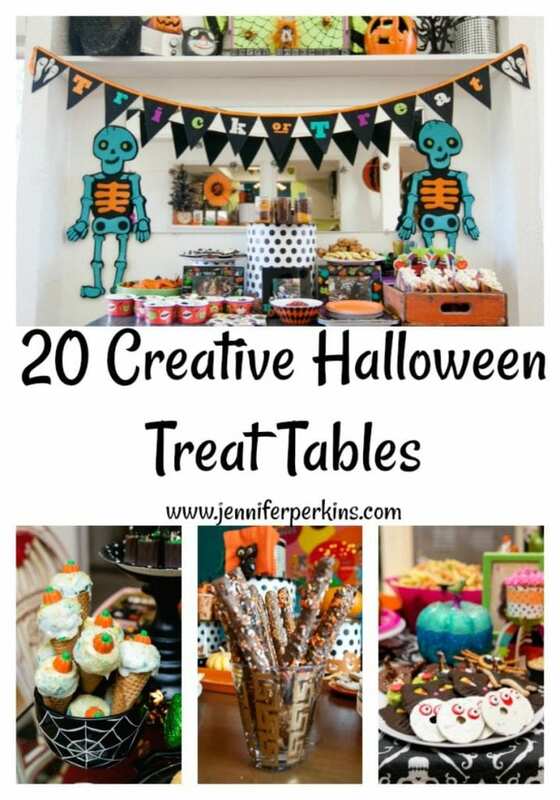 Let’s say you have 3 food tables and 21 rice cereal pumpkins (complete with Tootsie Roll stems I might add). Put 7 on each table. There is no reason to have all 21 piled up in the same place. Need some table decorating inspiration? Check out my post for DIY Network – Halloween Party Decorations Made With Washi Tape. Kids love food in cones, on a stick or in a push pop. You could put kale in these things and kids would love it. Fill push pops with alternating layers of brownie and chocolate icing. 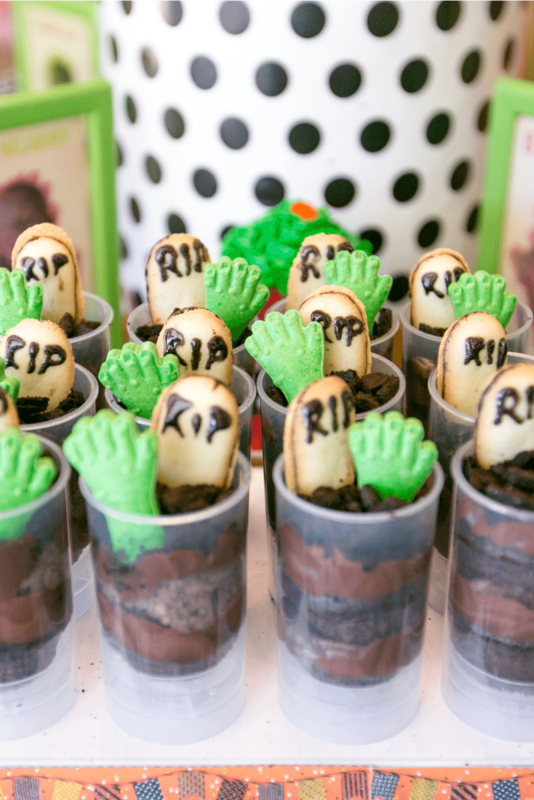 Top with crumbled cookies, green candy zombie hands and cookies made to look like tombstones. Here is a DIY for making Halloween Pop Corn Cones. Make each table a spectacle with a centerpiece and decor besides food. 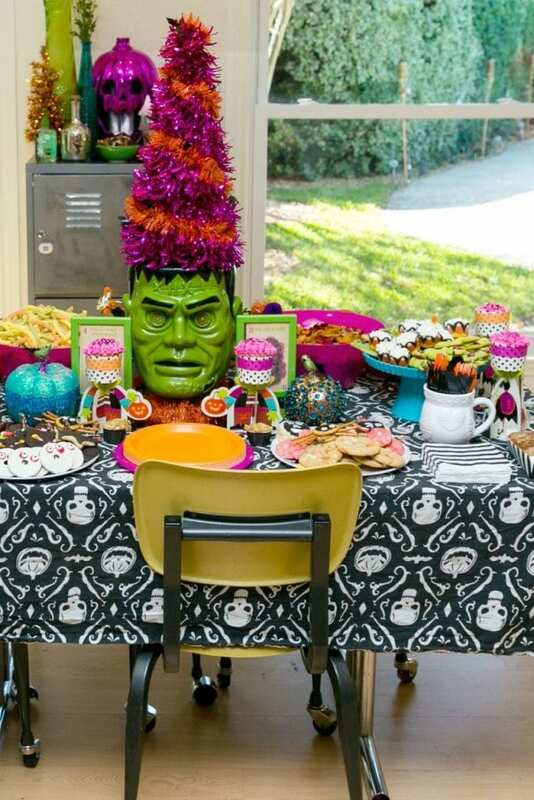 Add fun elements like cupcake stands and various Halloween colored serving dishes. I want each of my tables to look like a mini Willy Wonka and The Chocolate Factory Scene and leave the littles slack jawed in awe. 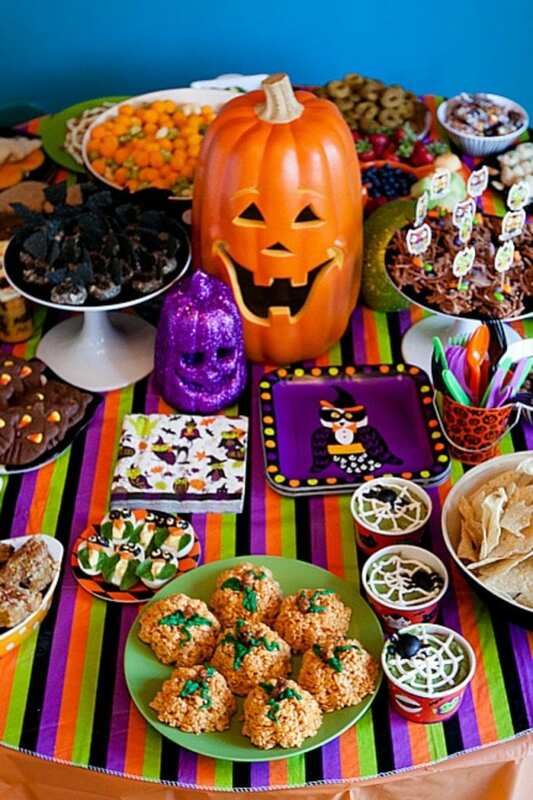 Speaking of littles you might like this post I wrote for the DIY Network about Halloween Games for a Children’s Halloween Party. You would be surprised how well baked goods freeze. We have a deep freeze and when I host my annual Halloween party you better believe I use it. Fun fact: baked goods can last 3-4 months in a deep freeze when sealed well. When you start that far out baking one thing a week it does not seem so daunting to have so many treats. Like spiders? Check out my post on Halloween sock spiders and a fun Halloween toss game for kids. Savory and sweet, healthy and junky, baked and fresh – mix things up. Have some items for adults like a nice cheese plate. Keep salsa on high and away from little dippers. For those goodie goodie parents provide some balance by having some healthy treats like fruit and veggie on the tables too. More Halloween ideas with skulls here. The devil is in the details and you have to think of the food at a party as the icing on the cake. Don’t spend all this time getting your decorations just right only to snooze the fun treats. 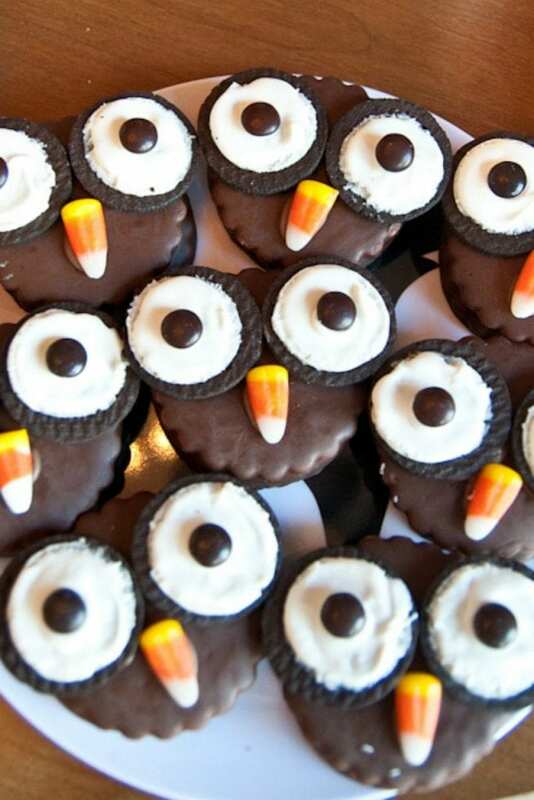 People will remember those owl moonpies you made, I promise it’s worth the time. 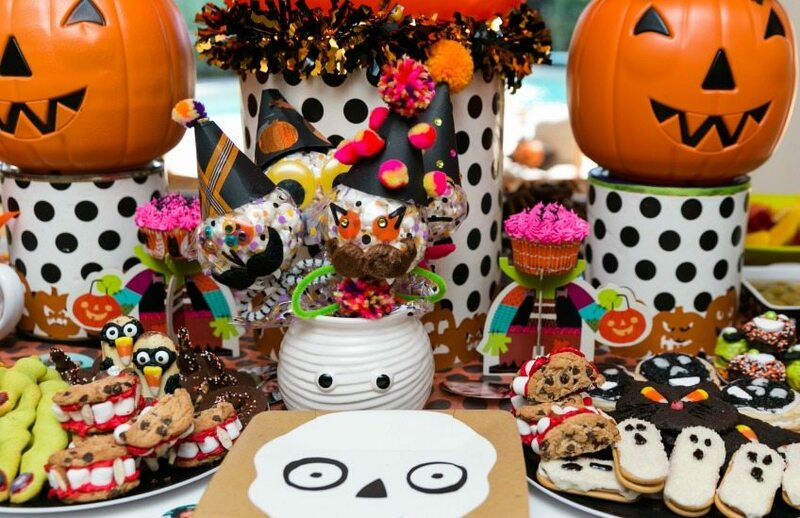 Check out the time the Hostess with the Mostess blog featured my Kooky, Spooky and Playful Pumpkin Halloween Party. Avoid cakes or things in bowls that involve serving utensils when you can. Cupcakes are WAY easier to hand out than cutting a cake. A giant bowl of fruit salad means a giant serving spoon. If you put fruit salad into small festive Halloween cups with a plastic fork for walking and eating – boom you are on to something. More Halloween pumpkin planters here. If your party is an annual event make some notes from year to year. What do you have a TON of left over? Maybe you should make less or skip it all together next year. Always run out of cake balls on top of mini ice cream cones first? Ya me too, we should both double that recipe. 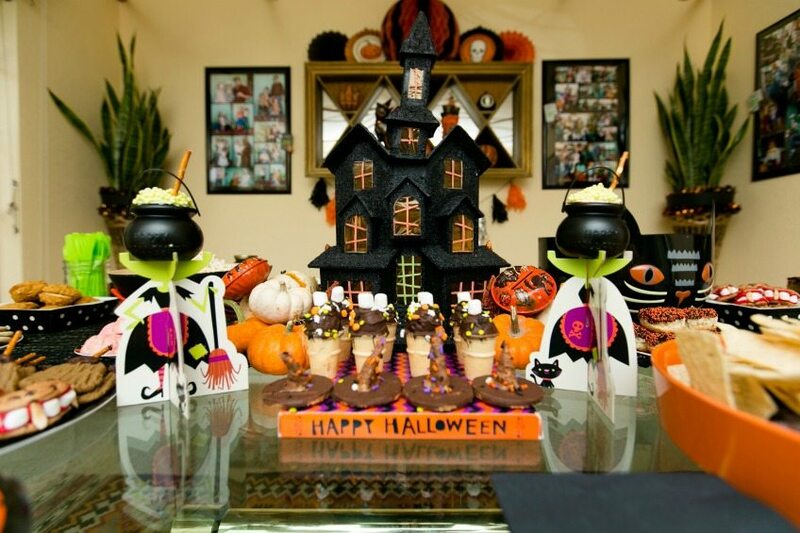 Read more of my Top Tips for Throwing a Perfect Halloween Party. Food coloring is your Halloween friend. Look I never said this was a healthy party. Green food coloring makes plain lemon bars spooky and icing on shortbread cookies (homemade lemongrass flavor I might add) spooky. You can’t make blood without red food coloring and who wants a witch finger cookie that does not look like it was ripped off someone’s hand. 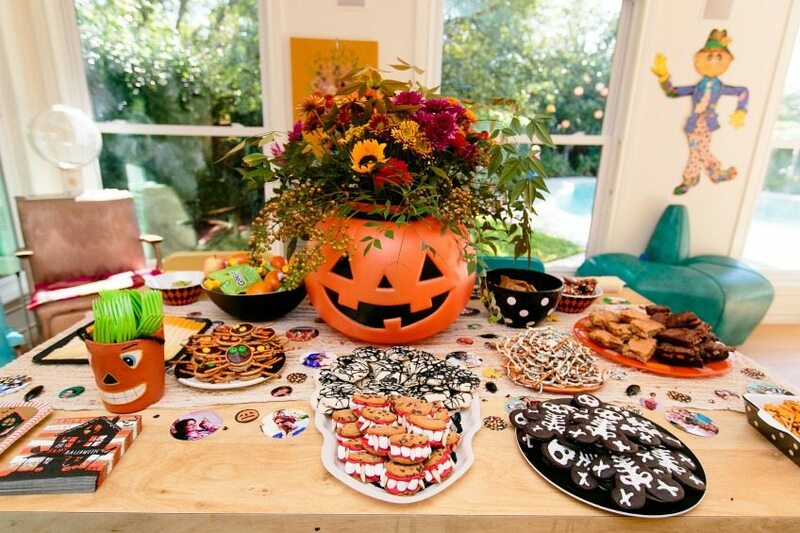 See more Halloween party pictures from the time my shin-dig was featured on Kara’s Party Ideas. It’s all about the layers. I hoard cake stands for my Halloween party. Not only does an array of cake stands give your party table more interest and dimension it also give you more space for more treats! I have a DIY in the archives about making a Halloween Serving Stand. Make your life easy and buy some ready made food. Nobody is going to judge you if you order cupcakes from the grocery store and call it a day. I like to cut corners by embellishing ready made cookies. See those ghosts and owls – ready made sandwich cookies adorned with icing. The popcorn ball people, I didn’t pop a single kernel. Dracula’s Dentures there – it’s not like I baked those chocolate chip cookies. 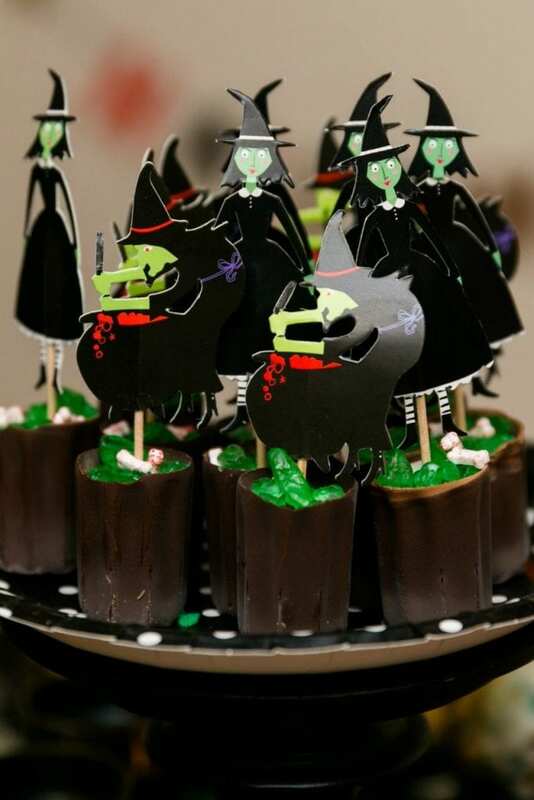 You might love these Color Blocked Halloween Cupcake Toppers. So sure, my party is a bit over the top. I get that. Remember it is kinda part of my job, plus I think of it as a hobby I plan year round for. I’ve been hosting one since 2009, but sadly this is the second year in a row the party will be on hold for family health reasons. I’m hoping to be back bigger, better and more baked goods than ever next year. I promise to take lot’s more pictures when we are back. In the meantime thank you Jennifer M. Ramos for all these gorgeous snaps! P.S. 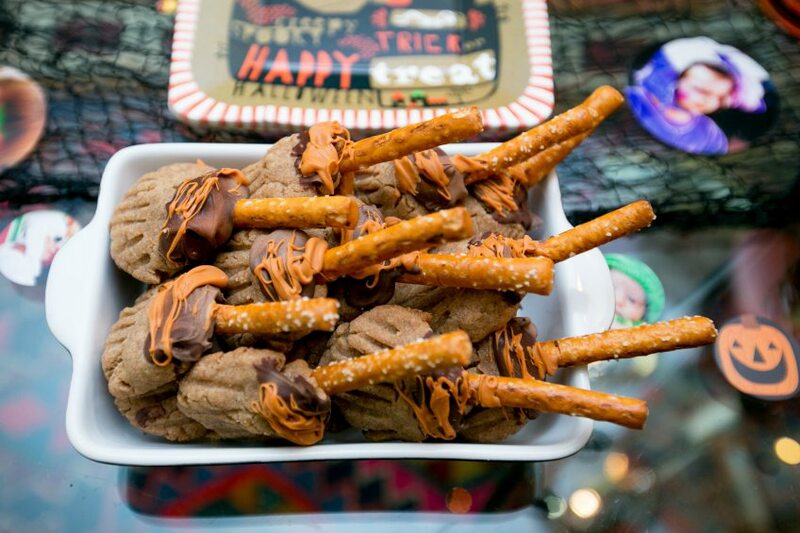 Is there a certain cookie, dip or brownie that you make every year for your Halloween party that everyone freaks out on? I’d love to know! Posted September 8, 2017 & filed under Halloween, Holidays, Parties, Uncategorized. LOVE these spreads! Go Jenn! Thanks Danielle – makes you hungry to look at! 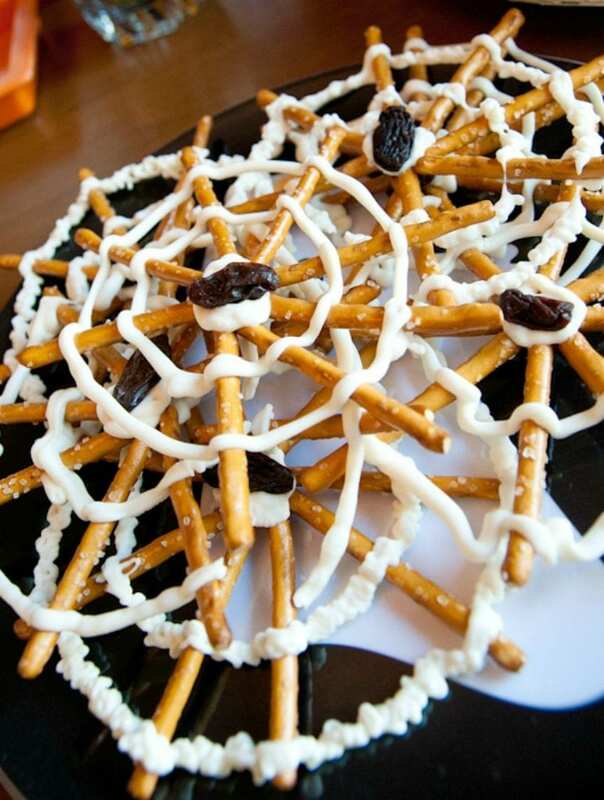 How do you make the pretzel spiders? Looks like marshmallows in the center. Also, I make ghosts that was a huge hit. I’d add a picture but that us not an option here. I like how you mention that you can serve spooky-looking desserts in a glass that also acts as table decor. To me, serving desserts in a glass makes it easier to eat and easier to clean up after. Inspired by your article, I will find places that sell glasses for me to try making different kinds of desserts with them.